“You are the light of the world” (Matthew 5:14 NIV). My brother was about four years old when he decided to grab a box of matches and a handful of sparklers to see how they worked. He had heard that sparklers worked best in the dark, so he went into the darkest place he could find at Grandma’s house…her wardrobe closet. Friends, we don’t have to go into a closet to find the darkness. It’s waiting for us the moment we step out the front door, turn on the television, or listen to the six o’clock news. The world is full of darkness at every turn. Satan is not our only enemy. The Bible tells us that our struggle is against the world, the flesh, and the devil. What exactly is the world? In the Bible there are several definitions. Sometimes world refers to all the people on the earth: “For God so loved the world that he gave his one and only Son” (John 3:16). In some instances world refers to the planet earth itself. At other times world refers to the world’s values and mores. It is this worldliness that Paul refers to when he says, “Do not conform any longer to the pattern of this world” (Romans 12:2). Jesus said that the world hated Him and we shouldn’t be surprised if it hates us as well (John 15:18-19). Both refer to the world’s values or ways of thinking. The Bible also tells us that “the whole world is under the control of the evil one” (1 John 5:19). It seems as though we are splitting hairs here. But when we consider the power of the enemy and the pull of the world systems, they are almost one and the same. Right now, the world systems are being heavily influenced by the evil one. But here’s the hope. Jesus said, “But take heart! I have overcome the world” (John 16:33).As long as we live in the world, we will feel its pull. But God assures us that we have what it takes to “overcome the world” (1 John 5:4-5). We have the power of the Holy Spirit living in us and faith in Jesus who works through us. As you go through your day, you may feel the pull of the world on your heart. A temptation to look at something you shouldn’t look at. A temptation to buy something that you don’t have the money to buy. A temptation to flirt with someone you should run from. A temptation to light up a sparkler in the dark to see what it looks like. You have the power to overcome every single temptation this world throws at you. So go about your day walking in the confidence and power of the conqueror you are. Heavenly Father, sometimes I am discouraged about all the darkness in this world I live in. It seems like there is evil at every turn. Some of it huge, like Isis. Some of it small, like enticing billboards. Thank You that You have made me more than a conqueror—that You have given me the power of the Holy Spirit to overcome the darkness that surrounds me. Help me walk in the sure-footedness of a woman who knows in Whom she believes. Jesus said that He was the light of the world (John 8:12). But did you know that He also said that YOU are the light of the world (Matthew 5:14)? How are you like a light in this world? According to what Jesus said, recorded in Matthew 5:14-16, what are you to do with the light that you have been given? 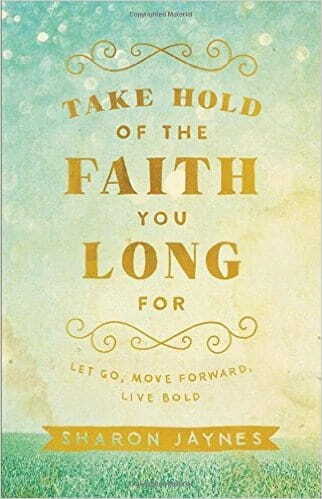 Available for Pre-order: Take Hold of the Faith You Long For: Let go! Move forward! Live bold! On the outside, many women are well-put-together Christians with trendy shoes, beautiful children, and wide, white smiles. On the inside, those same women are little girls cowering at the edge of the playground, hoping no one notices them, yet still wishing they could join in. They've professed faith and know the right things, but they struggle to truly take hold of the "life more abundant" that Jesus offers. Instead, they settle for a life that's less than what God has promised them. In this liberating book, I reveal the most common reasons women get stuck with a mediocre, mundane faith. Then I show you how to break free and move forward, leaving behind the feelings of inferiority, inadequacy, and insecurity that are holding you hostage. I uncover untapped sources of confidence and courage, equipping you to move from knowing the truth to actually believing it—and living it out boldly in a life marked by true freedom. Let go! Move forward! Live bold!